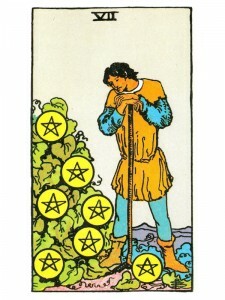 Seven of Pentacles says you are experiencing a cycle of change that will affect your income for the better. Break through the blocks that prevent you from achieving your highest potential. Free your talents by shedding the weight of any psychological or emotional resistance. Move through your old fears of failure – evaluate the results of your efforts and assess your mistakes so that you can learn from them. Be patient – this cycle is changing and re-arranging your life. You will know growth through good honest effort and hard work. Plan your next move during this pause in activity. You are in the process of making a major decision. There will be a welcome change in your financial situation – so stop worrying! Meaningful work gives more than material benefits – you grow as you experience a moment of looking back with satisfaction on something you have accomplished, knowing that what you have built has reached the point that it can grow by itself and you can step back from it without collapsing it. Use the energy of your “fears” to propel you forward – concentrate your strength – act with will and determination. New cycles and directions based on previous achievements, such as the harvest which must save part of the crop for seeding next year’s planting as opposed to the totally new beginnings of the Aces. Here are the material results of hard physical work and the shifting from one aspect of a task to another, as in from farming to harvesting/storage. A shift from one job to another within a company or a given field. There is abundant supply, enough for reserves. Ample food supply. Inventory, taking stock of material worth. Savings, investments, good results of a fund drive. A healthy budget for the next phase. Harnessing of, yet harmony with nature. A ripeness, maturity, preparedness. An advanced level of establishment, cycles of security over a number of years. Physically and materially worldly, experienced. Here is the professional, one who knows the ins and outs of their livelihood and has become inseparable from it. Aspects of real property, real estate. A good season in business, especially retail. A significant stature has been achieved at this point. Aristocratic in all the good senses of the term. What is growing and maturing that you are concerned about? What do you fear will fail or be spoiled? What mistakes did you make in a past similar situation and what can you do differently now? What investments have you made in time, money or labor that worry you? How have your efforts been worthwhile? Nine of Cups and Wheel of Fortune in the spread: Your intuitive powers are acute now and you can make important decisions. Three Sevens in the spread: Consider everything before making your choice – you are surrounded by changes and opportunities. Next to Empress: It is best not to be too critical or concerned if you do not receive instant approval from your partner. In the first position: Your path will bear the mark of the aristocrat, with all the advantages and responsibilities accruing thereto. Part of your arsenal is your distinguished bearing, broadcasting your level of knowledge and achievement in pragmatic affairs, affecting the lives of many. In the second position: Your physical resources are just that, your physical resources. You may draw at will on the reserves amassed through your past efficiencies. You have been in harmony with your environment. In the third position: Prepare for the harvest time or for the new planting, as this represents the cusp of reinvigoration. Summon the maturity of your wealth of experience, for this is a turning point, a new direction for the course you have already begun. Collect the assets that are yourse, claiming all debts that are due. An increase in material appetite is appropriate, albeit with greater selectivity. In the fourth position: Your passion lies in the handling of the harvest. Here also are the tapes for the consummate professional. The gourmet chef fits here, as does the organic farmer or an investment banker. The deft handling of resources to bring about increase and pleasure is the common denominator. In the fifth position: Taking stock of the harvest and/or making plans for the next major turning point in your Physical/material Plane. You are confident that you have the resources you need. In the sixth position: When the silos are full again in the near future, you will have the dynamics of change at work in your Emotional Plane, impacting relationships and/or creative affairs. In the seventh position: What to do? How to collect wisely? How to spend wisely? The responsibility for investing wisely the results of your’s and others’ past labors. In the eighth position: You are selling some of your old stock to invest in new issues or in order to collect capitol for investing in some other new venture. Taking energy accrued in the past and putting it to work for the future. A shift in jobs within the same company or field. In the ninth position: There is a warmth, a sense of satisfaction at a job well done, enriched by the security your past efforts have afforded. There is also the excitement of anticipation of the next phase of growth. In the tenth position: Begin now to prepare for the shift from past to future that marks the selection of the next major fork on your path. Your physical environment, any of the major elements of your Physical/material Plane, especially livelihood, may be involved.